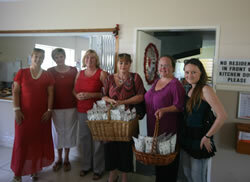 Chas Everitt Randburg team sharing the love on Valentines Day with gifts and food for the residents, volunteers and staff at the Ann Harding Cheshire Home. As part of the ChasCares programme False Bay team has selected The Emma Animal Rescue Service, TEARS. As part of this engagement Chas Everitt’s False Bay agents have offered to assist with fund raising and also to collect and deliver directly to TEARS donations of dog and cat food, carpets, blankets kennels and unused items that can be sold at shops run by TEARS for fund raising. will be distributed encouraging False Bay residents to take the opportunity to ‘declutter’ and benefit a worthy cause at the same time without any hassle. Those wishing to support this effort can simply call the Chas Everitt office on 0217841630 and one of the agents will call and collect the donated item no matter the value or size and have it delivered to TEARS. All donations will be acknowledged by Tears. Together with other welfare organisations, TEARS has been invited to be one of 30 local organisations to apply for a R30 000 cash donation from the Chas Everitt Cape Region. Every Chas Everitt office has the ability to invite their adopted welfare organisation to apply for the R30 000 cash grant that will be awarded at a function to be held in July that will be the culmination of the 30th Anniversary celebrations. We had the great opportunity and privilege to host an Easter Egg Hunt party for the children at Lambano Sanctuary (www.lambano.org.za) situated in one of our areas. Lambano accept into their care children who have been abandoned or orphaned, especially those affected by HIV / Aids. The staff at Lambano are doing amazing things for these amazing children. Our Team at Chas Everitt Bedfordview / Edenvale sponsored the Easter eggs and goodies that put huge smiles on all the little ones’ faces. We even had the Chas Teddy bear mascot to bring even more excitement and cuddles to the day. All in all, it was a great morning filled with lots of surprises, joy and laughter. Definitely something that touched the hearts of the more privileged. JC-daycare centre opened its doors in January 2003 in Morningstar, Durbanville, a previously disadvantaged residential area. Today they have 54 preschool children and 30 after school children in their care. They have five full time staff members. They also have volunteers who help with a reading program and other activities for the children. They work together with the Social Workers, in cases of abuse in the families. A reading program is being run, to make sure that the children do not get behind, due to overcrowded classrooms at the schools. A lot of enrichment activities are also presented by volunteers, in order to stimulate the children on all levels. JC-daycare is run only on sponsorships from the comunity. Chas Everitt Northern Suburbs in conjunction with retail stores around the area is collecting food supplies for the daycare to keep them going over the cold and rainy season.